As reported across the world, Jack Ma announced his retirement plans as executive chairman of Alibaba Group on 2019, on his 55th birthday. While many are aware the success of Alibaba today is due to the amazing leadership by Jack Ma, not many are aware that Alibaba’s success was due to the exceptional leadership of other co-founders as well. Inforgraphic #1 : Alibaba founders - where, when and how did they meet ? 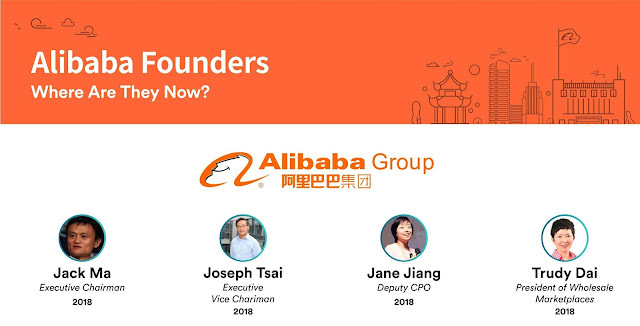 Inforgraphic #2 : Alibaba founders - where are they now ? Jack Ma was the pioneer who explored the Internet in China, in one of his interviews, he shared that he attempted to upload an image to the Internet and gathered a group of friends to witness the loading of it on a website - it took them almost the whole day ! In another sharing, he shared that Alibaba had no income for first 3 years of business, not until the escrow service was launched. The vision of Alibaba to help China's manufacturers to go global was a strategy that was timely and socially enterprising - it benefited everybody especially the people of China. The combined effect of Internet pioneer, social enterprise, China's manufacturing power, e-commerce for world market deserves a place in the textbook of Harvard business schoool.